Tervetuloa lukemaan blogiani. Tarkoituksena on rähistä ja meuhkata estottomasti yhteiskunnallisia asioita poliittisesti epäkorrektisti ja liiemmin soveliaisuussääntöjä miettimättä. Ideana on kuitenkin se, että jorinoissa ja huudossa on jokin ajatus, jotakin asiaa ja ehkä jotakin järkeä joskus. Johtoajatuksena voisi olla anonyymiksi jääneen merirosvon yli kolmesataa vuotta sitten esittämä vaatimus: LESS LAWS, MORE JUSTICE!! Koska se "luotettava suomalainen valtamedia" on melko yksituumaisesti julistanut Yhdysvaltain uuden presidentin taas sotahulluksi raiskaajariistäjäksi presidentin valatilaisuudessa pitämän puheen perusteella, lienee syytä käydä läpi koko puhe sellaisena kun presidentti Trump sen piti. "Chief Justice Roberts, President Carter, President Clinton, President Bush, fellow Americans and people of the world – thank you." Korkeimman oikeuden ylituomari Roberts, presidentti Carter, presidentti Clinton, presidentti Bush, kanssa-amerikkalaiset ja maailman ihmiset - kiitos. "We the citizens of America have now joined a great national effort to rebuild our county and restore its promise for all our people." "Together we will determine the course of America for many, many years to come." "Together we will face challenges. We will confront hardships. But we will get the job done." "Every four years we gather on these steps to carry out the orderly and peaceful transfer of power." "And we are grateful to President Obama and First Lady Michelle Obama for their gracious aid throughout this transition. They have been magnificent, thank you." "Today’s ceremony, however, has very special meaning because today we are not merely transferring power from one administration to another – but transferring it from Washington DC and giving it back to you the people." Tällä seremonialla on, kuitenkin, hyvin erityinen merkitys, sillä tänään me emme vain suorita vallanvaihtoa yhdeltä hallinnolta toiselle - vaan siirrämme sen Washingtonista takaisin teille kansalaisille. "For too long a small group in our nation’s capital has reaped the rewards of government while the people have borne the cost." "Washington flourished but the people did not share in its wealth. Politicians prospered but the jobs left and the factories closed." "Their victories have not been your victories. Their triumphs have not been your triumphs. While they have celebrated there has been little to celebrate for struggling families all across our land." "That all changes starting right here and right now because this moment is your moment. It belongs to you. It belongs to everyone gathered here today and everyone watching all across America today." "And this – the United States of America – is your country." Ja tämä - Amerikan Yhdysvallat - on teidän maanne. "What truly matters is not what party controls our government but that this government is controlled by the people." 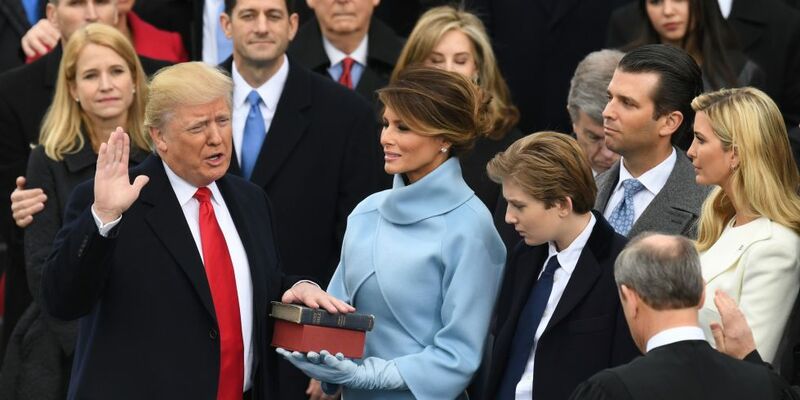 "Today, January 20 2017, will be remembered as the day the people became the rulers of this nation again. " "You came by the tens of millions to become part of a historic movement – the likes of which the world has never seen before." Te tulitte kymmeninä miljoonina tullaksenne osaksi historiallista liikettä - sellaista jota maailma ei ole koskaan aikaisemmin nähnyt. "At the centre of this movement is a crucial conviction – that a nation exists to serve its citizens." Tämä liikkeen keskellä on olennainen vakaumus - että tämä kansakunta on olemassa palvellakseen kansalaisiaan. "Americans want great schools for their children, safe neighborhoods for their families and good jobs for themselves." "These are just and reasonable demands." "Mothers and children trapped in poverty in our inner cities, rusted out factories scattered like tombstones across the landscape of our nation." "An education system flushed with cash, but which leaves our young and beautiful students deprived of all knowledge. And the crime and the gangs and the drugs which deprive people of so much unrealised potential." "We are one nation, and their pain is our pain, their dreams are our dreams, we share one nation, one home and one glorious destiny." "Today I take an oath of allegiance to all Americans. For many decades, we’ve enriched foreign industry at the expense of American industry, subsidised the armies of other countries, while allowing the sad depletion of our own military." "We've defended other nations’ borders while refusing to defend our own." "And spent trillions and trillions of dollars overseas while America’s infrastructure has fallen into disrepair and decay." "We have made other countries rich while the wealth, strength and confidence of our country has dissipated over the horizon." "One by one, shutters have closed on our factories without even a thought about the millions and millions of those who have been left behind." "But that is the past and now we are looking only to the future." "We assembled here today are issuing a new decree to be heard in every city, in every foreign capital, in every hall of power – from this day on a new vision will govern our land – from this day on wards it is only going to be America first – America first!" Me tänne tänään kokoontuneet julistamme uuden valan kuultavaksi jokaisessa kaupungissa, jokaisessa ulkomaalaisessa pääkaupungissa, jokaisella vallan käytävällä - tästä päivästä lähtien uusi näkemys hallinnoi maatamme - tästä päivästä eteenpäin se on oleva Amerikka ensin - Amerikka ensin! "Every decision on trade, on taxes, on immigration, on foreign affairs will be made to benefit American workers and American families." "Protection will lead to great prosperity and strength. I will fight for you with every bone in my body and I will never ever let you down." "America will start winning again. America will start winning like never before." "We will bring back our jobs, we will bring back our borders, we will bring back our wealth, we will bring back our dreams." "We will bring new roads and high roads and bridges and tunnels and railways all across our wonderful nation." "We will get our people off welfare and back to work – rebuilding our country with American hands and American labour." Saamme ihmiset irti sosiaalituista ja takaisin töihin - jälleenrakentamaan maatamme amerikkalaisin käsin ja amerikkalaisella työllä. "We will follow two simple rules – buy American and hire American." Seuraamme kahta yksinkertaista sääntöä - osta amerikkalaista ja palkkaa amerikkalainen. "We see good will with the nations of the world but we do so with the understanding that it is the right of all nations to put their nations first." "We will shine for everyone to follow." "We will reinforce old alliances and form new ones, and untie the world against radical Islamic terrorism which we will eradicate from the face of the earth." "At the bed rock of our politics will be an allegiance to the United States." "And we will discover new allegiance to each other. There is no room for prejudice." "The bible tells us how good and pleasant it is when god’s people live together in unity." "There is no fear, we are protected and will always be protected by the great men and women of our military and most importantly we will be protected by god." "Finally, we must think big and dream even bigger. As Americans, we know we live as a nation only when it is striving." "We will no longer accept politicians who are always complaining but never doing anything about it." "The time for empty talk is over, now arrives the hour of action." "Do not allow anyone to tell you it cannot be done. No challenge can match the heart and fight and spirit of America. We will not fail, our country will thrive and prosper again." "We stand at the birth of a new millennium, ready to unlock the mysteries of space, to free the earth from the miseries of disease, to harvest the energies, industries and technologies of tomorrow." "A new national pride will stir ourselves, lift our sights and heal our divisions. It’s time to remember that old wisdom our soldiers will never forget, that whether we are black or brown or white, we all bleed the same red blood of patriots." "We all enjoy the same glorious freedoms and we all salute the same great American flag and whether a child is born in the urban sprawl of Detroit or the windswept plains of Nebraska, they look at the same night sky, and dream the same dreams, and they are infused with the breath by the same almighty creator." "So to all Americans in every city near and far, small and large, from mountain to mountain, from ocean to ocean – hear these words – you will never be ignored again." Niinpä kaikki amerikkalaiset jokaisessa kaupungissa lähellä ja kaukana, pienessä tai suuressa, vuorilta vuorille, valtamereltä valtamerelle - kuulkaa nämä sanat - teitä ei tulla enää koskaan väheksymään. "Your voice, your hopes and dreams will define your American destiny." "Your courage, goodness and love will forever guide us along the way." 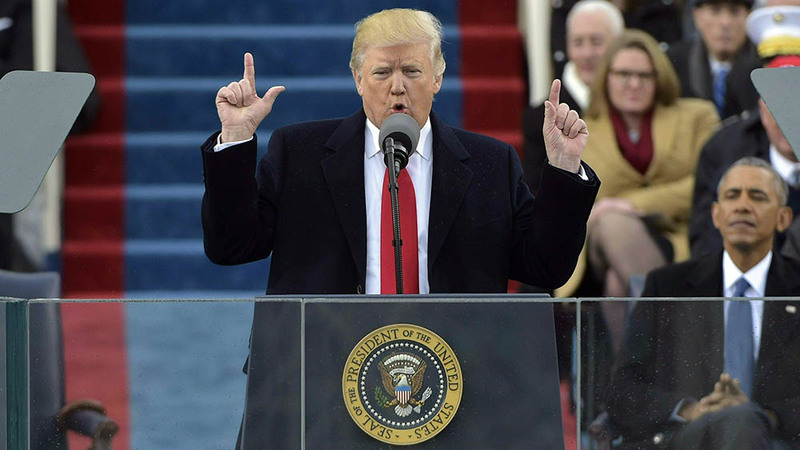 "Together we will make America strong again, we will make America wealthy again, we will make America safe again and yes – together we will make America great again." Yhdessä me teemme Amerikasta taas vahvan, me teemme Amerikasta taas vauraan, me teemme Amerikasta taas turvallisen ja kyllä - yhdessä me teemme Amerikasta suuren jälleen kerran. Niin, tällainen oli se presidentti Trumpin virkaanastujaispuhe, joka demarikansanedustajan mukaan oli "pelättyä pahempi" ja joka ministeri Orpon mielestä ei vastannut "suomalaisten kysymyksiin." Demareita varmasti pelottaa puheessa se, että se on vasemmistolaisempi kuin mikään puhe mitä he tai mikään suomalainen vasemmisto on pitänyt viimeisen kahden vuosikymmenen aikana. Kokoomusta kauhistutti varmasti puheen isänmaallisuus, sillä kokoomuksella tai muillakaan puolueilla ei ole ollut isänmaata kahteen vuosikymmeneen. Lyhyesti sanottuna: valtamedian versio puheesta ja sen sisällöstä oli jälleen kerran täyttä propagandaroskaa. Trump ei puhunut siihen sävyyn kuin "luotettava valtamedia" väitti. Trump ei lietsonut vihaa, homofobiaa, sotaa, raiskaamista eikä rasismiakaan. Ei, vaikka meille on perjantaista saakka niin uskoteltukin. Oikeastaan ei ole kyse täydestä propagandaroskasta, vaan jostakin vieläkin pahemmasta: suomalainen valtamedia ja 'asiantuntijat' ovat vajonneet kaikkein eristyneimpien viidakkoheimojen alapuolelle. Heillä ei ole mitään älyllisiä työkaluja ja käsitteistöä, joilla voi arvioida Trumpin kaltaisia ilmiöitä. Tuohon sanon AMEN. Ei ole muuta lisättävää. Erinomainen kirjoitus-jälleen kerran. Kiitos! Järkevä puhe. Trump uskaltaa. Ei tartte nöyristellä EU:ta kuten meidän vellihousu poliitikot. Meille vaan toitotetaan "Paluuta entiseen ei ole". Eli annetaan maamme rikollisille valtaajille. Suumme tukitaan, tiikerihait lukee kirjoituksiamme ja poistaa, vaikka puhuisi kedon kukkasista. Obamasta on asiantuntijamme sanoneet, että hän oli KESKINKERTAINEN PRESIDENTTI. Sotahullu, joka tunki pommikoneensa hajottamaan ja tappamaan. Meidän petturit ANTOIVAT USA.LLE ISÄNTÄMAASOPIMUKSEN NOJALLA RANTAUTUA SOTILAINEEN JA HÄVITTÄJINEEN MEIDÄN MAAPERÄLLE. Tarkoitus vain uhitella naapuriamme Putinia. TE SUOMEN PELKURISOTAHULLUT, rukoilkaa Jumalalta apua, ja hävetkää tappaja Naton jumalointia teille avun tuojaksi. Kiitos tekemästäsi suomennoksesta! Jospa noi dyslektikot ja kielivammaiset NYT ymmärtäisivät jotain... Mutta lienee toiveajattelua koska yleisesti on sinutkin leimattu rasistiksi, joten määrätty sakki ei blogiasi edes lue. Ja se on sääli se. Eikös Trump todennut puhuessaan CIA:n väelle, että hän on jatkuvassa sodassa median kanssa. Ne ovat maailman epärehellisimpiä ihmisiä. Ihmeen hyvinhän se on presidentti perillä myös suomalaisen median toiminnasta. Täytyy tosiaan ihmetellä, hyvin on perillä. Strive on ponnistella, thrive on kukoistaa. "... vain silloin, kun se ponnistelee." Suomen päättäjien kannattas varmaan ottaa mallia tosta että omat ensin.Pitäs heidänki kattoa joskus omaa kansaa eikä eu:n haluamisia.Meillä tiloja kaatuu kun ulkomailta tuodaan tuotteita kalliilla.Työpaikat on kortilla.Esim.virosta tulee työntekijöitä tänne koska ovat halvempia.Asiaa on koko Trumpin puhe.Pitäs täälläki löytää samanlainen päättäväisyys ja voimavara nostaa Suomi ylös mudasta. Ei suomalaiset osaa valita omaa trumppia. Paasikivi sanoi: Suomalaiset ovat poliittisesti typerä kansa puhui väki suomea tai ruotsia. Ainoastaa hävitty sota yhtä tai kahta suurvaltaa vastaan voi saada Suomessa politiikan muutoksia aikaan. Viimeksi tämä tapahtui 1950, jolloin suomalaiset rakensivat tuhotun maan uudelleen ja jatkoivat hyvin vointiaan Neuvostoliiton hajoamiseen saakka. Sitten alkoi kansallisomaisuuden hävitys, ei suinkaan kansalaisista johtuen vaan näiden valitsemien vallanpitäjien toimesta. Jos kaikki tuo mitä puheessa sanottiin olisi vilpitöntä, hän olisi lyyrikko, profeetta, Jeesus, Jumala. Vastaavia, parempiakin, käännöksiä on myös "valtamediassa". Blogisti sivuuttaa (pinnallisesti, ehkä myös tahallaan) olennaisen asian puheen tulkinnassa, kontekstin (jossa ylipäätään kaikkien sanojen merkitys ja tulkinta määräytyy). Tässä tapauksessa kontekstin muodostavat Trumpin aiemmat puheet ja teot sekä puheen pitämisen paikka, virkaanastujaiset. Blogisti antaa implisiittisesti ymmärtää, että vain "suomalainen luotettava valtamedia" on tulkinnut puhetta virheellisesti. Tosiasiassa saman tulkinta puheesta on tehty kaikkialla maailmassa: niin eri valtioiden päämiehet, ministerit ja poliitikot kuin myös media. Minä en ole havainnut kenenkään väittävän, että Trump olisi puheessaan suoraan yllyttänyt sotaan, raiskaamaan ja vammaisia haukkumaan. Blogisti rakentaa siis olkinuken. Asiantuntijoiden mukaan puhe poikkesi kaikista edellisistä virkaanastujaispuheista. Se oli - ja tämä on se oikeasti yleinen tulkinta kaikkialla maailmassa - populistinen ja nationalistinen. Se oli kuin suoraan vaalikampanjasta, omille kannattajille suunnattu. Minun ymmärrykseni mukaan populismiin ja nationalismiin ei yleensä liitetä ajatusta sukupuolten, ihonvärien tai seksuaalisten suuntautumisten tasa-arvosta. Siten esimerkiksi naisten, seksuaalivähemmistöjen, ei-valkoisten ja vammaisten on perusteltua olettaa, ettei Trump ole tuomassa heille hyvää - varsinkaan kun muistetaan Trumpin aiemmat sanat ja myös teot. Tätä kutsutaan kontekstiksi. Trump ei siis yllyttänyt puheessaan suoraan myöskään sotaan. Mutta nationalismiin - jota puhe vääjäämättä voimakkaasti edusti: America first! - ei kuulu ymmärtääkseni myöskään korostunut rauhantahtoisuus. Nationalismi on aiheuttanut lukemattomia sotia, pahimpina molemmat maailmansodat, ja esimerkiksi Saksassa viisi sotaa 150 vuoden aikana. Trump liittyi osaksi Euroopassakin voimistunutta nationalismia, eikä aivan perusteetonta ole pelätä, että sen tien päässä odottaa sota - tai sotia. Puhe on tulkittu kaikkialla maailmassa periaatteessa samalla tavalla. Uskooko blogisti - kuten Putin ja Venezuelan Maduro näyttävät uumoilevan -, että koko läntinen maailma vapaine lehdistöineen on solminut maailmanlaajuisen salaliiton Trumpia vastaan? Mikä mahtaisi olla motiivi? Miten salaliitto pysyy salassa, kun siihen täytyy kuulua tuhansia ja taas tuhansia osallisia? Vai olisiko sittenkin niin, että blogistilla totuus tekee hieman liian kipeää? Joku haluaa itse tulkita puheen ja joku, että joku toinen tulkitsee sen, kun ei luota omaan lukutaitoonsa. Viittaukset nationalismiin ja populismiin ovat roskaa, mutta vaalilupaukset, joita ei ole tarkoituskaan pitää, ovat oikeaa määritelmän mukaista populismia tarkoituksena kiihottaa kansa äänestämään puolutetta. Ei tuohon ole oikein muuta lisättävää kuin että to strive ei merkitse kukoistaa. Se enemmänkin merkitsee voimallista, sisukasta pyrkimistä, ponnistelua tai tavoittelua. Sen voi myös merkitä sitä, että antaa kaikkensa jonkin hyväksi. Tämä puhe käännöksineen oli todella hieno homma. Tällaista on turha etsiä Hesarista tai muista ns. "sanomalehdistä". Toivottavasti Suomeen saataisiin edes yksi sanomalehti, jonka artikkeleihin voisi luottaa. Älä nyt sentään Anonyymiko, niin älyttömyyksiin mene, että vedät Jeesuksen vertaamaan presidenttiä. Pitää olla joku raja, ollakseen uskottava. Tämän vuoksi kirjoituksesi on pelkkää löpinää. Yksi tärkeä korjaus: Tämä kohta: "We see good will with the nations of the world but we do so with the understanding that it is the right of all nations to put their nations first." Me tulemme etsimään ystävyyttä ja hyvää tahtoa maailman kansakunnissa mutta teemme niin ymmärtäen, että jokaisen kansakunnan oikeus on asettaa omansa ensimmäiseksi. komiaa ja asiaa puhui ja ensimmäiset toimet ovat oikeansuuntaisia jo tunnin sisään puheesta. Kyllä koira koiran tuntee, USAn valtamedia käsittelee Trumpia omalla tavallaan todesta piittaamatta, ja sen perässä kipittää pieni ja sinnikäs suomalainen valtamedia. Erikoisinta on että tuosta oman demokratiansa pakkoviennistä muualle ja kansojen oikeuksista omiin arvoihinsa on valtamedia vaiennut kokonaan. Se oli nimenomaan eniten meitä koskettava kohta puheessa. En silti panisi rahojani likoon Trumpin puolesta, mies on kuitenkin täysin arvaamaton ja puhuu ristiriitaisia – Trumpin omat twiitit kun eivät sentään taida olla valtamedian suodattamia. "Tulemme vahvistamaan vanhoja liittolaisuussuhteita ja muodostamme uusia, ja vapautamme maailman radikaalia islamistista terrorismia vastaan, jonka tulemme poistamaan maan päältä." Tässä Trump siis sanoo kiihottavansa koko maailman samaan "terrorismin vastaiseen" sotaan, jota Yhdysvallat on käynyt kaiken aikaa Bushin ja Obaman johdolla. Todellisuudessahan kyse on USA:n imperialismista, hegemoniapyrkimyksistä ja öljyvaltioiden alistamisesta. Eikö tästä nähdä, ettei Trump tuo muutosta vaan lisää sotia? Se jää lopulta nähtäväksi, ennakkoon on vaikea tuomita puoleen tai toiseen. Kyllähän Trumpin naisvihamielisyys on ilmennyt jo hyvin konkreettisella tasolla hänen tehdessään ensitöikseen muutoksia aborttilakiin. Järjestöt jotka ovat jakaneet köyhillä alueilla tietoa ehkäisystä,ehkäisyvälineitä ja ohjanneet naisia turvallisiin abortteihin puoskareiden sijaan, eivät saa enää USAN rahoitusta toimiinsa. Mitään lakeja tai oikeuksia ei ole muutettu, abortti ei vain enään ole ilmaista tai rahoitettu veronmaksajan rahoilla. Paikkakunnat missä abortti ei ole mahdollista ei mahdollistanut sitä alunperinkään. On edelleen myös mahdollista lahjoittaa hyväntekeväisyyteen omilla rahoillasi, se ei vain enään ole pakollista. Kyllä Jumala voisi olla isolla- ei siis jumala. Kai se sitä amerikkalaisen uskon Jumalaa ( God ) tarkoittaa. Trump on poikkeuksellisesti jaksanut lukea puheenkirjoittajansa tekstin kokonaan lisäilemättä omia kommenttejaan. Bushia varoitettiin sodasta terrorismia vastaan; se on vain kylvänyt uuden terrorismin siemeniä. Samaa voi sanoa sodasta huumeita vastaa; USA:n vankiloista on tullut suurta bisnestä, joissa käytetään mitättömistä syistä vangittua orjatyövoimaa tuotannon pyörittämiseen ja siinä sivussa uuden rikollissukupolven kasvattamiseen. SOTE - RIKOSHISTORIAN SUURIN KAVALLUS?